You can find a bunch of free, educational flashcards for kids that I created here. They cover a lot of early learner topics like shapes, colors, numbers, and counting to name a few. Below are a few cool products that kids are sure to love. We have a set of Sesame Street flash cards that our youngest daughter enjoys--sometimes she'll just hold them while she watches the show! There are also a few interactive flash cards that can be used on your computer. When you're done looking around, be sure to take advantage of my free worksheets at the bottom of this page, that cover many of the flashcard topics. I hope that you've been able to use the printable flash cards that I created (link above). Sometimes it's good to have a nice set though, we have quite a few of them in addition to the ones I've created. 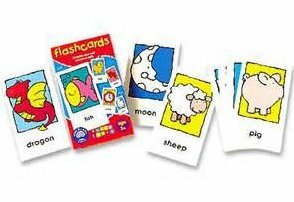 Check out the products below to find flashcards covering a wide variety of early topics.